Heavy Relic Job by John Cruz! 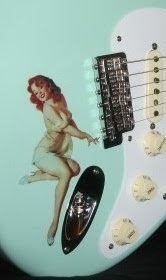 If you liked the Custom Shop Jeff Beck Tele job, but prefer a Strat, this could be for you! AND it's relatively cheaper than the JB Tele. RELATIVELY. This one is about as relic as it gets. 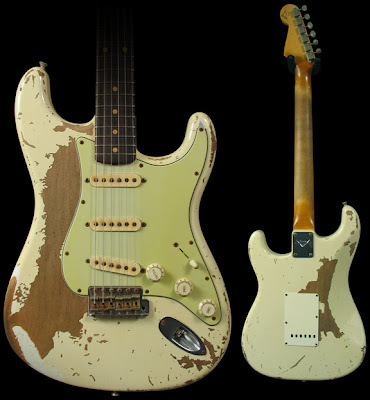 Currently available at The Music Zoo, this '60, Olympic White, Masterbuilt by John Cruz comes with a complete Fender new guitar warranty. I'm tryin' to be serious here-- it's important to plug the warranty. Obviously, the paint isn't polyurethane. Nor is it Sears Weatherbeater. Nitro Nouveau Distresso all the way baby! That's all I'm gonna say about it.